You can't head to college without a set of dorm bath towels and college washcloths. 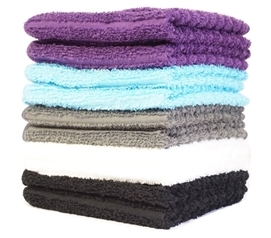 Dorm towel sets help you stay clean, and they're dorm essential college supplies. However, you don't want just the bare dorm necessities to get you by. 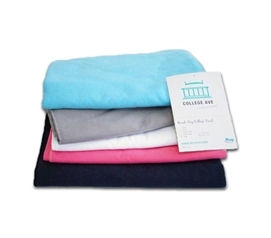 Dorm towels and college washcloths are dorm essentials that you need plenty of. Keep plenty extra dorm towels and college washcloths handy because there will be times you don't want to or can't do laundry. DormCo offers a variety of colors and dorm towel sets that you can choose from so that you can have your favorite colors in your dorm necessities! When it comes to cheap college supplies and dorm necessities, DormCo has it! We have towel and wash cloth sets for any graduating high school student heading off to college. Dorm life doesn't need towels that cost $10 a pop, buy one of our cheap sets and your bathroom dorm supplies will be complete with money left over for all the other dorm stuff that you'll need. Dorm washcloths and towels are a college dorm essential and the more you have the less often you have to be bothered with doing your laundry!